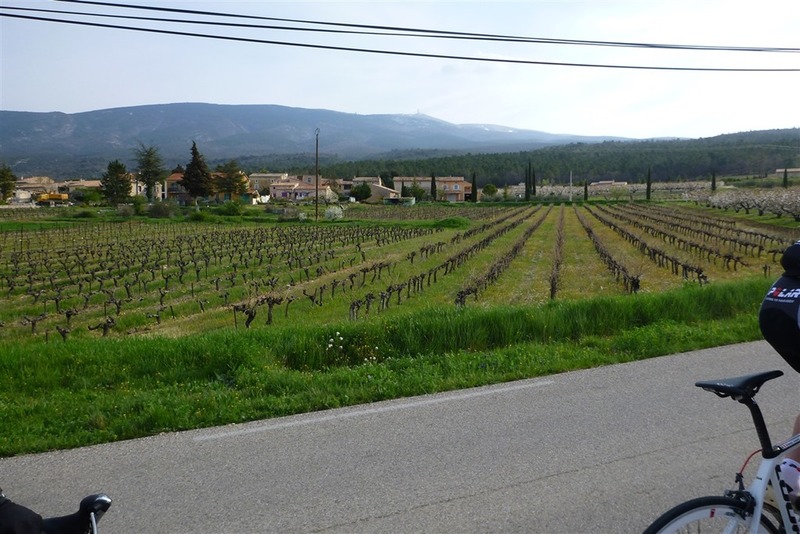 My journey started about 8:30AM from a small hotel in many miles below the peak of Mount Ventoux. 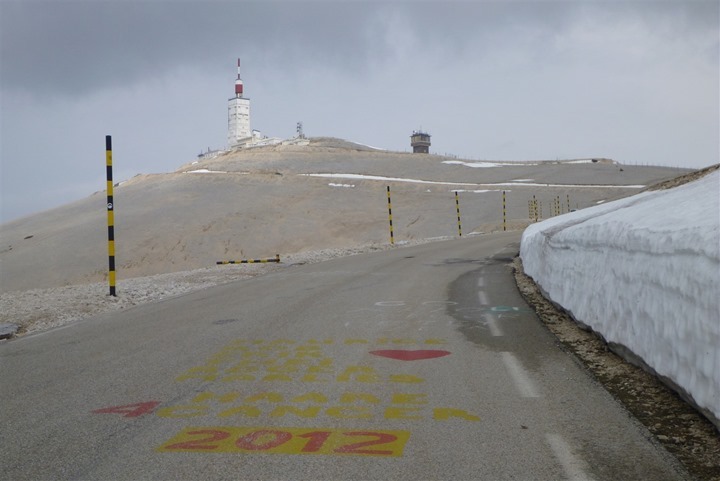 The summit is well known in the Tour de France – and probably has an even more visible reputation than any other stage in the race beyond the finish. 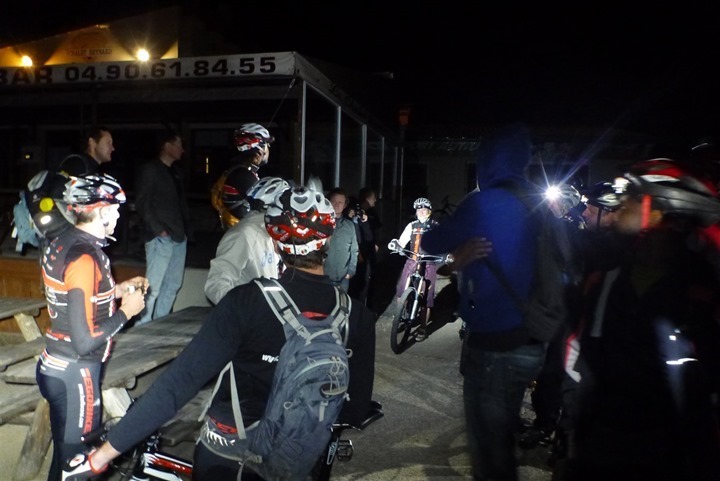 After gathering up everyone in the group (upwards of 30 people, support cars and more), we headed out on. It didn’t take long after leaving the hotel until we started to ascend. Maybe a minute or two. Clearly, I should have savored those two minutes more than I did. My wheels almost floating along, easily turning at a relatively quick pace. And the climbing would not soon end. At this point, we had already gone 4KM (uphill) with only 18KM of climbing remaining (about 12 miles). No biggie, right? You can see off in the distance that little tiny smokestack looking thing on the mountain. That’s where I’ll get to stop pedaling. I figured it’d be totally OK to collapse at the top if required. 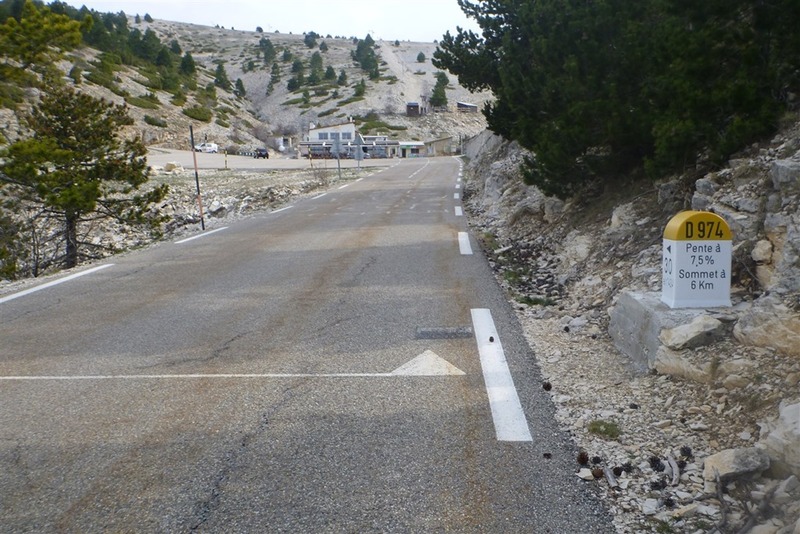 After all, all the TdF riders collapse at the top of this famous mountain stage. Surely I could too. It didn’t take too long for the gaggle of 20-30 riders to splinter into smaller groups. Probably about one minute after the climbing starting actually. And by about 10-15 minutes, there were only small groups left of 1-4 people. As is usually the case at media events, the journalists have a wide range of athletic capabilities from semi-pro (or former pro) to those more comfortably on a campus cruiser for a mile or two. As I snaked my way up the roadway, you can see remnants of past year’s encouragement to riders written on the ground. This spot that I took the photo below is actually amongst my favorites on the entire route. It swerves back and forth a bunch of times, like ‘S’ turns. Really cool (and pretty). 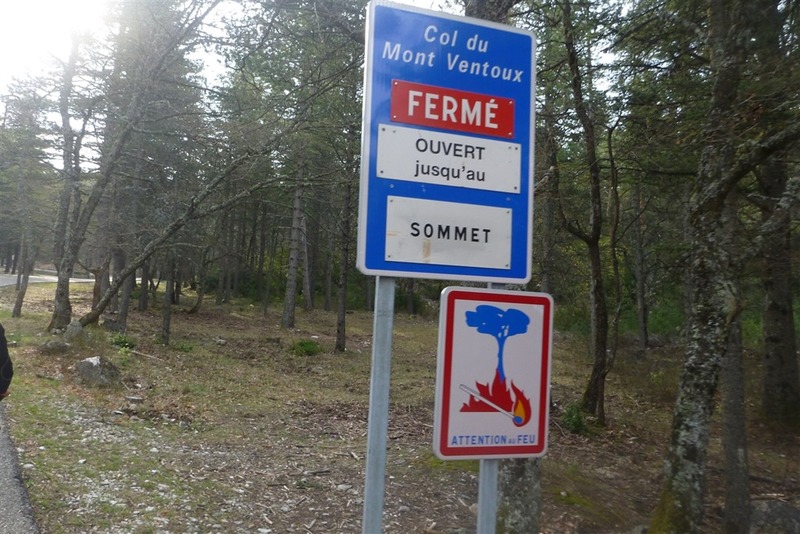 It was around this point I saw another one of the nuclear explosion signs (there’s one in the park that I see often in Paris). It’s actually a sign for not causing forest fires, but from far away it looks like a little atomic bomb went off. As we continued climbing you started to see the trees and vegetation lessen. Slowly but surely, each 100m in elevation would shrink the trees and surrounding shrubs. Perhaps my favorite item along the route was the every 1KM markers that listed the number of kilometers left (10KM below), the current altitude (1,077m), and the average grade for the next kilometer (9% in this case). I’ll point out I never saw less than 7% for the average for a single kilometer, and I think the highest average was either 11 or 12%. Of course, that’s the average for that next section. Sometimes there would be sections within that which were steeper. More up I went. It’s a bit fuzzy, yes. Sorta like how I was feeling about then. 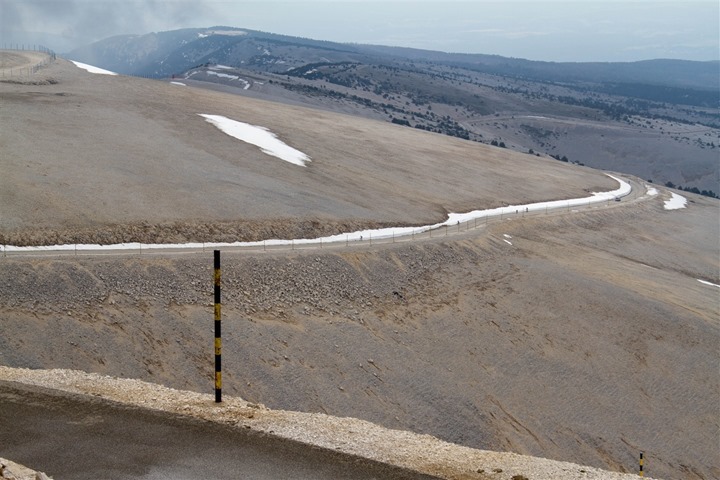 Actually, from an overall cycling fitness standpoint – I was in pretty good shape. Aerobically my lungs felt quite good, and my legs were having no issues. What was having issues however was my back. Holy cowbells this bike was different. My back was hurting by about 2-3 miles in, just a totally different fit than my triathlon bike (they provided us loaners). Not their fault, just the road bike had me much more stretched out. That was probably my primarily limiter in climbing. If I was on my bike, I suspect I would have been quite a bit faster. 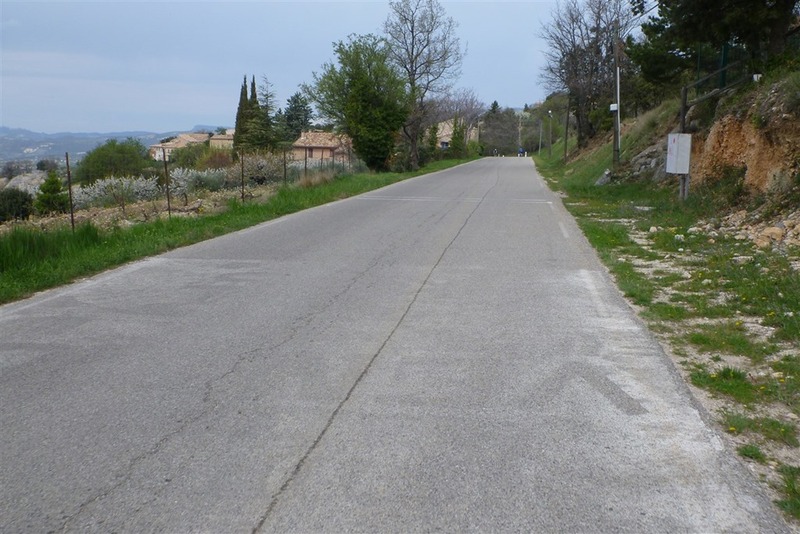 And then, even further up the hill at just about the next turn – I see yet ANOTHER 6KM to go sign. This was like those ‘friendly’ people who stand at the 24 mile marker of a marathon and say ‘Only a mile to go!’ Lies I tell you, lies! At least the sheep sign was unassuming. Though, I spotted no sheep. What was interesting was that once I turned this corner, I really started accelerating. The grade was a bit less steep than down lower (7-8% on average versus 10-11% earlier on). And I was really quickly flying past folks. What was surprising was that most folks I talked to thought the last 5K was the worst, whereas I thought it was the easiest. Go figure. I think I passed 4-5 people in the last few kilometers. And there really weren’t that many people up ahead of me to pass. Not that this was a race or anything. Even more importantly than the snow, or me+snow, was the 1KM to go marker. 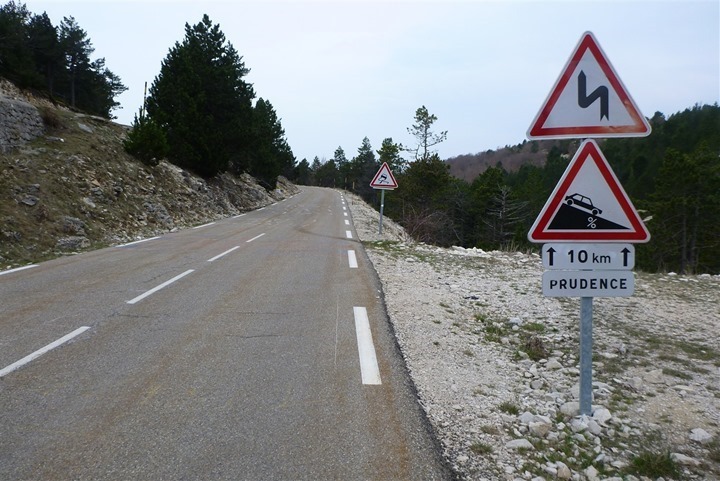 Dear cycling gods, let this sign be accurate. What was interesting is that this last 1KM was really split as two ~500’s from a terrain standpoint. The first 423m was relatively flat. But the second 577m was not at all, averaging 11%. Yes, I said 577m, as there was actually a 577m to go marker just like the 1KM marker for reasons that are slightly unclear to me. Deep down inside, I think they just wanted a reason to post 11% again and make you cry. And 577m was apparently the spot to post it. The view from up there was pretty astounding. For those attempting to do the math in their head – 1,912m is equivalent to 6,273ft. Given the incoming fog, I decided to get out of dodge. Rain was forecasted for later on, and the last thing I wanted to deal with was descending down 12% grades on winding wet roads. So, down I went. It took me about half an hour to descend. In general, I can be a quick descender once I know the road in question, and know the bike and its capabilities that I’m riding. Given I knew neither of these at a comfortable level, I tend to be a bit slower. Once out of the mountains it was still a bit further down until you got to the village I was staying in, which was right at the base of the descent. Speaking of which, here would be the crossroads of the end of the descent, and the village. The little town I was in (Bédoin) was actually really cute. The hotel was a few hundred meters out of town, but in town there were numerous bike shops where you could rent a fairly darn nice carbon road bike for the day (or mountain bike for the numerous trails to the top). 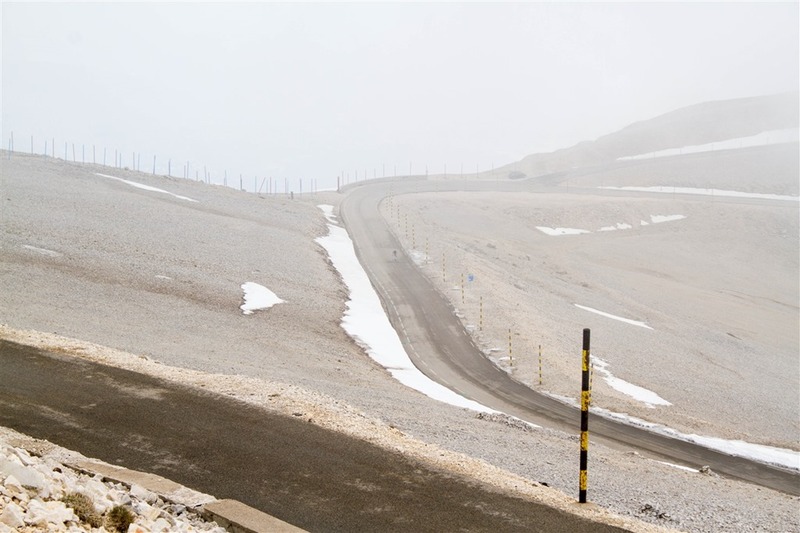 One could easily arrive here with no cycling stuff, and go ride up to the peak. If coming from outside the region, you’d take the TGV (high speed rail) train to Avignon TGV. There are two stations, one in the city center, and the TGV one outside. The TGV station is probably the prettiest train station grounds I’ve ever seen. Then from there you can rent a car from half a dozen car rental places onsite and drive the 45 minutes to Bédoin. There may be regional trains, but I haven’t looked. A taxi is about 80€. Other folks also flew into Marseilles, which is about 90 minutes away by car from Bédoin. 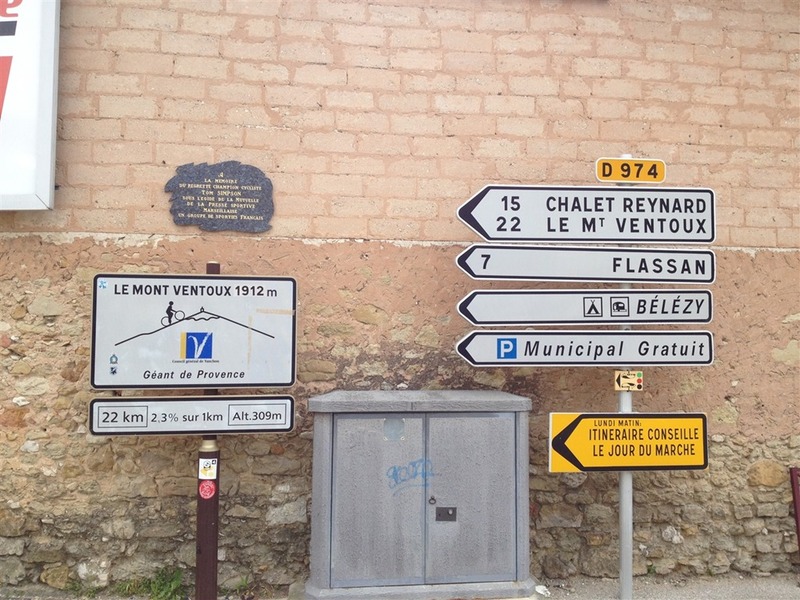 Once in Bédoin, the road to the top of the mountain literally starts right in the center of town at the sign above. You can’t miss it, nor could you get lost if you tried as you just follow the markers (or paint on the ground). Additionally, once at the top of the mountain, you can actually descend down the other side and come back up (to make it longer). That road is currently covered in snow however. With that, I was back down at the hotel. 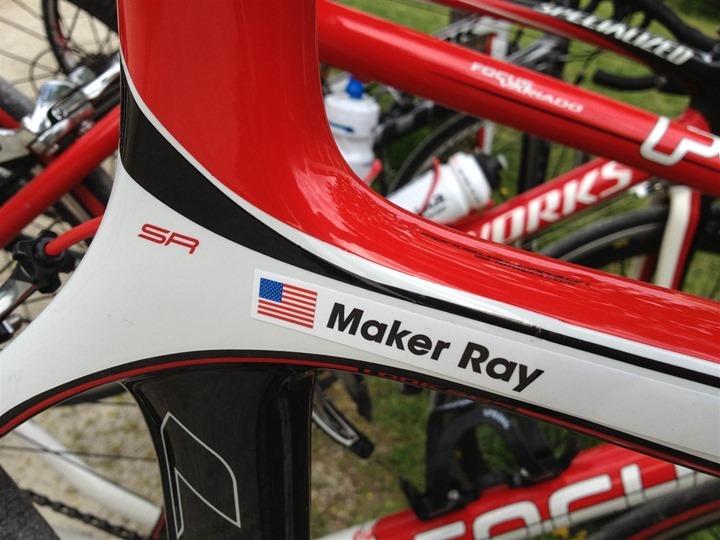 Speaking of which, while there, they had even labeled my loaner bike for me. Now that we’ve covered the good stuff, some might be wondering why exactly is it that I would leave home on a Thursday night for 24 hours after just arriving back hours prior, take off a day of work when I was just getting ready to fly back out of the country again for more work 48 hours later – all to go cycling with a bunch of people I didn’t know (without The Girl!). 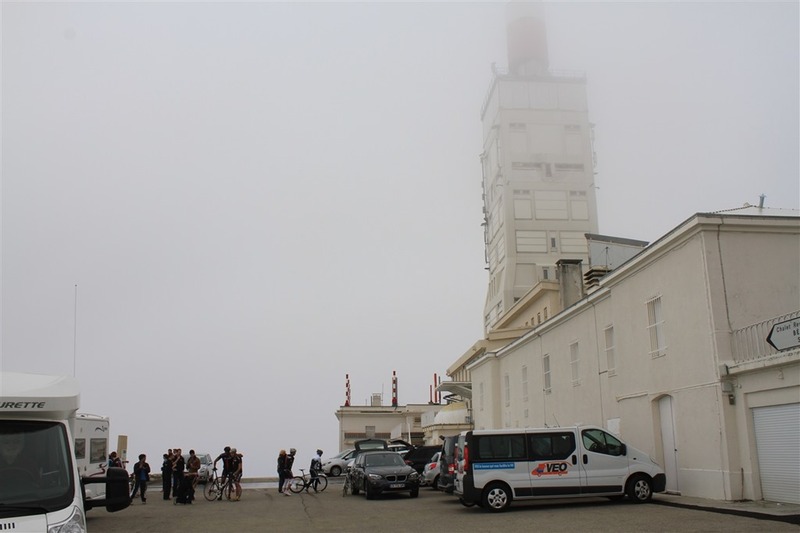 Well…I had been invited to a Polar media event, which was to introduce a new cycling product. Like most sport company media events, they usually involve some sort of athletic activity to test the product being announced – hence the riding above. That’s usually preceded by various PowerPoint slides and expert and/or invited speakers talking as well. The usual stuff. And as usual for these events, I pay my own travel expenses. In this case that was thankfully relatively inexpensive for me since it was just a 2.5 hour train ride away from Paris in Avignon, France. Except there was one tiny itty bitty teensy weensy little problem. As they started the presentation, it became clear there was no new product. 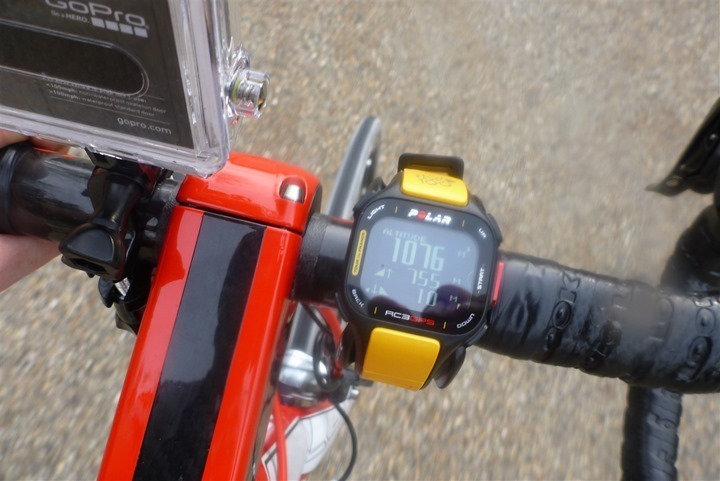 Instead, there was just a new colored strap for an existing product – the Polar RC3 GPS. The one I reviewed in-depth last summer. A number of other mainstream cycling publications noted this discrepancy as well. 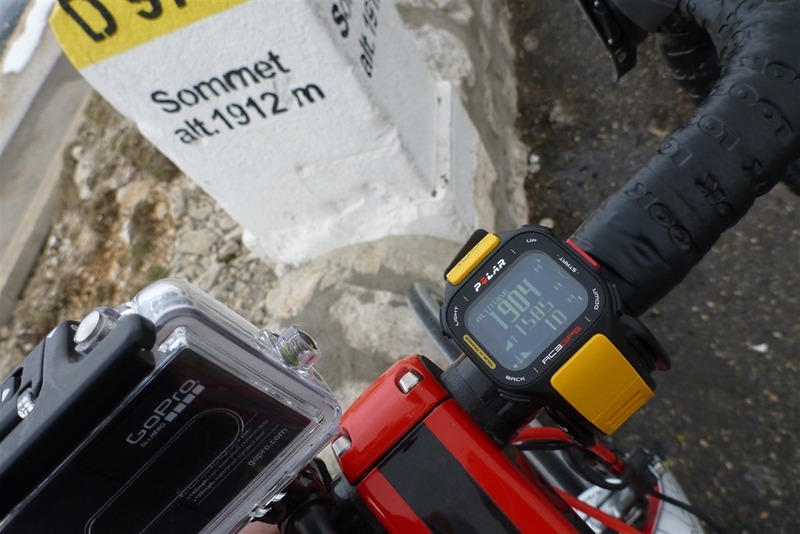 The Tour de France branded product did include the new altitude display firmware that’s been previously released and announced to the RC3 GPS lineup. But that’s GPS based, and not barometric based. Turning yellow lemons into lemonade, I went ahead and paid close attention to the altitude on the RC3 GPS as I climbed. 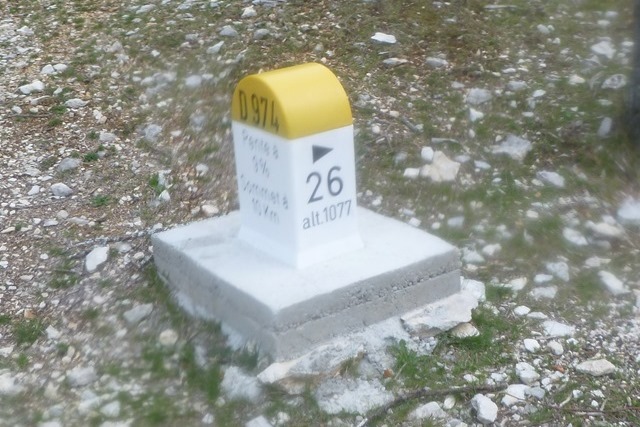 Since there were altitude markers every 1KM, this made it easy. Surprisingly, it actually tracked way better than I typically see GPS altimeters track. And in fact for the first 1000m or so of ascent, it was exactly spot-on each time, or within 1m (minimum resolution of data display). Somewhat astounding. Here’s the elevation chart (I took a slew of photos at the top for 15 minutes before descending). Update/Note: Polar has confirmed that for any existing Polar RC3 GPS users, you can send in your RC3 to Polar and they’ll update the firmware with both the altitude functionality as well as the semi-new interval functionality (older RC3 units wouldn’t have had that). Just ring up your local country support and they’ll get you sending in instructions. There is no cost, it is free. As you can see, the chart is quite good and pretty stable – no major jumps or issues on the way up or down. With that, that’s all I’ve got! So while I’m grateful for the opportunity to enjoy two awesome rides, I do really wish we’d see a cycling-specific product from Polar that’s competitive with other units on the market. Nice reading. As a kid I have always been fascinated by this mountain. I have hiked up there 3 times from Brantes. For cycling it is still on the planning. Love to see the Dutch comments at 6 km left. “Nog een klein stukje”, yes indeed little left but still up. It was closed for cars so that is nice riding then. I have spend many summer holidays in that region, nice climbing areas everywhere. Was the biscuit shop and sweat shops set up at and open at the summit…cannot see them in your photo? They are bit of an institution….that and the treats taste extra delicious when you get there. 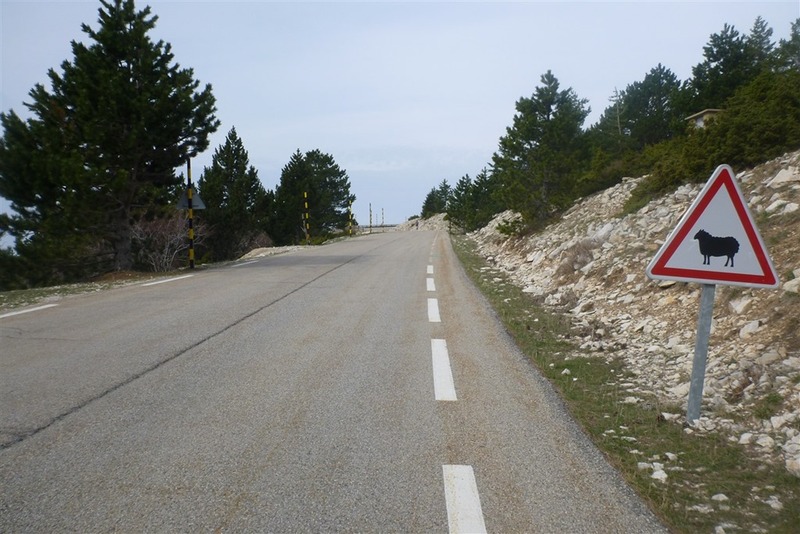 Word of caution for riders thinking of doing Ventoux…..you need to be careful of the weather… and the sheep…..
You can absolutely fly on the way back down, but there can be flocks of sheep all over the road below the cafe in the forest area…they often have bells on them which is a great sound, but they are not going to move for you. I have met a group of rides who where doing an escorted tour. ie ride between hotels, with a van that takes baggage forward to next hotel and does sag wagon. They only had one day to have shot and do the climb which I guess temped one of their members to ride around a road closure sign. He ended up with hypothermia and was getting blown off his bike, apparently he could not even keep his glasses on his face without holding them on..he was very lucky the cafe just near the forest was able to help me (and treat him). Moral of the story its a wonderful place to ride with many fantastic rides in the region around it, but, allow some time and don’t tempt fate with the weather at the top. 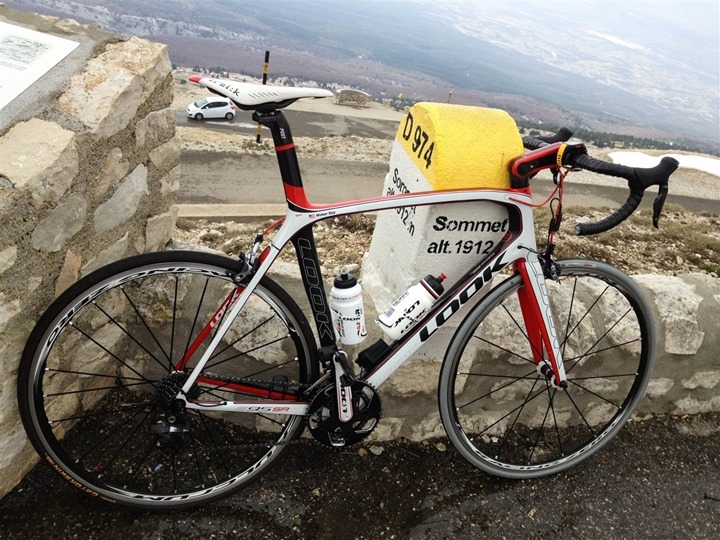 Great report, fascinating and legendary climb! Respect for your enthusiasm! Hope to read more such stories, it´s always fun reading it. Go on! 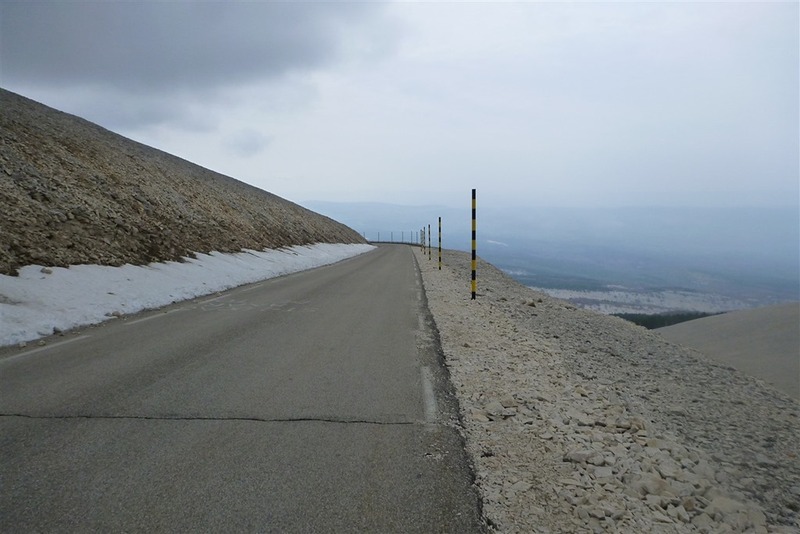 Real nice post to read, and great ride to the top of Mt Ventoux! Dude you are an ABSOLUTE beast. 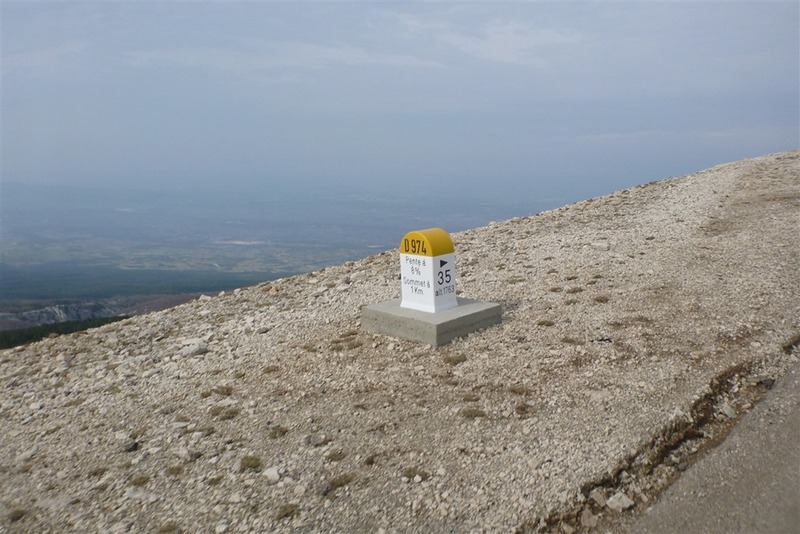 “For those attempting to do the math in their head – 1,912m is equivalent to 6,2732ft.” Either you put the comma in the wrong place (haha) or you fat fingered the keyboard or you really climbed Mt. Everest twice. Cheers. 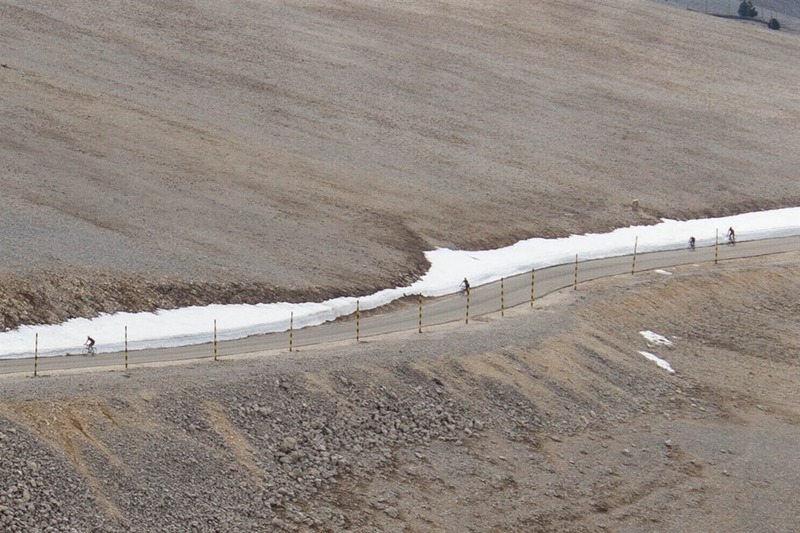 A polar event with one person using powertap hubs? (not sure if the first pic is just a large one hub or a powertap making it 2 people) No pedals from polar to measure power? Someone did BYOPT (Bring your own PowerTap). I had assumed the bikes would be outfitted with the Polar Power System, but given the RC3 doesn’t support that – I could see the logic with not installing it. 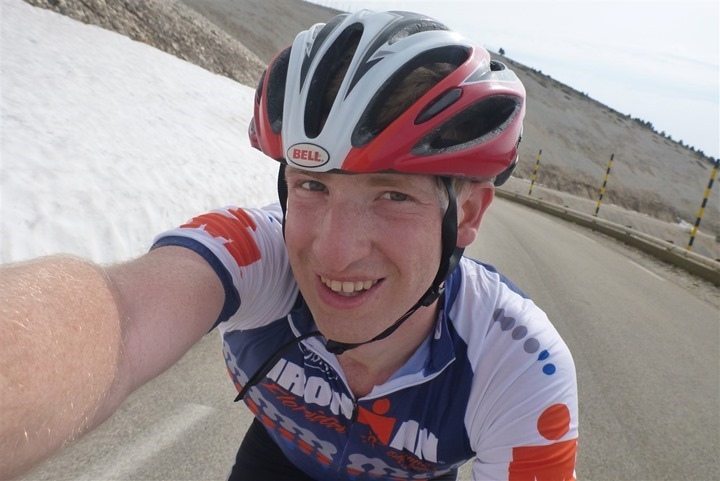 It’s kind of funny that you’re climbing a mountain while wearing an IMFL jersey. That’s insane, and the climb graph is impressive, looks like your RoA is quite constant. Any tips for getting better at climbing, a 8% grade has a tendency to make me fall over. Mostly just a lot of training. 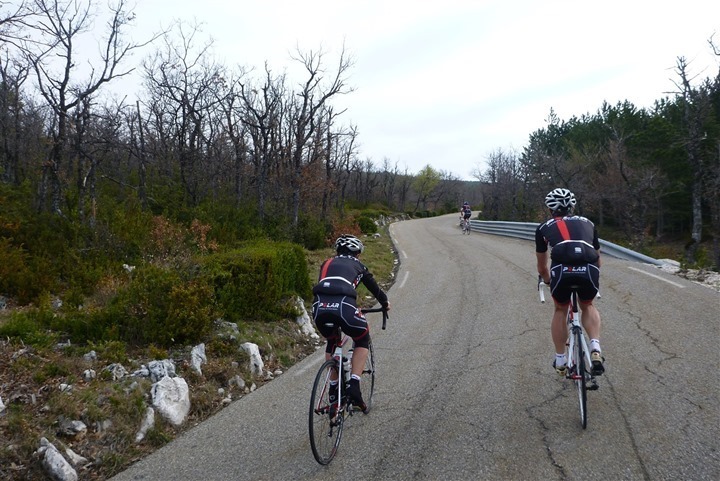 Obviously in Paris there’s virtually no hills, so a lot of trainer time in hard intervals. That an understanding how to pace while going uphill helps. In this case I definitely started out too hard. Or, perhaps, I finished too easy. I enjoyed your article both for what was and was not there. I wish that you also had a fantastic article or just spy pictures about the new POLAR BT power meter and cycling head unit or iPhone enabled true multi-sport watch, or even a POLAR swimming watch for that matter. 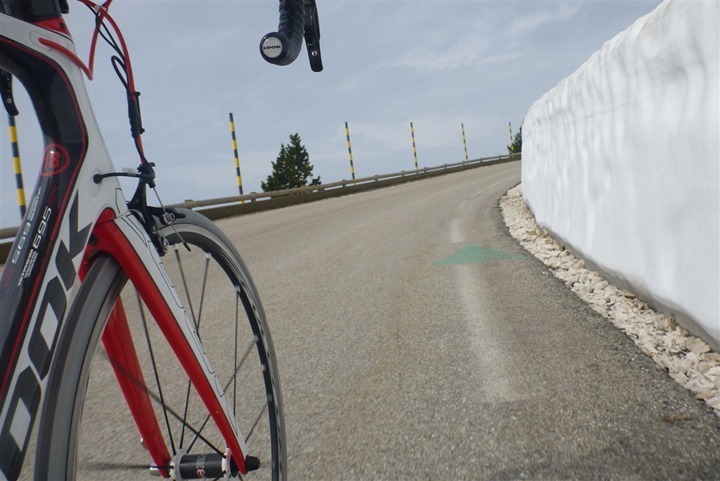 I would have looked forward to the Garmin/POLAR pedal based power meter shootout with real data from you traveling to all the greatest climbs in France. The suspense, the headlines, the PR, the readers and buyers!! 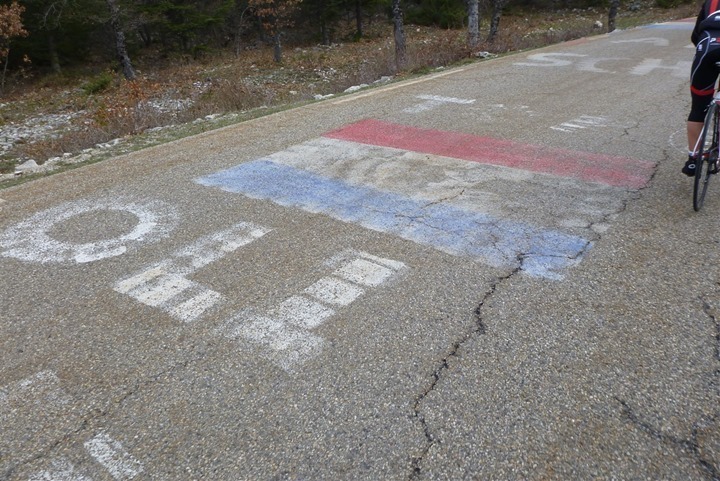 Something worthy of the 100th yr TdF. But alas, this is so sad, Its like attending your grandparents birthday party. Hi, could you say what gears you were peddling. Did they set you up on a 11/28 compact. You still would need lots of long intervals > 250 watts for => 10% grade and on your morning workout you were holding 282w for 10 minutes just as a workout. I live in the mountains and need a 12/30-54/18 to make my tri bike training rides (55k with 800m gain). I try to avoid the 10%, but suffer on lots of 7%. Eek. The bike did have a compact on it, but I didn’t check the cassette in the rear unfortunately. Sorry! Ray – Other than the fit issues, what did you think of the Look 695? It was a good bike, but honestly for me I’m spoiled in being used to my existing bike being fit to me (like most I suppose). great read as always. thank you. what gearing on your bike? Do you have a link for the firmware update on RC3 GPS? It’s not downloadable. It requires either a new unit, or sending your unit in (though, I’m not 100% clear the altitude piece gets added, but I do know that the interval function gets added). Ok, confirmed with the Polar folks. You can send in your RC3 and get both the interval and altimeter upgrades…for free. Just ring up support and they’ll get you all setup. Enjoy! man 8% is no joke! Well documented adventure as always. Great post Ray. I would love to ride up this legendary mountain one day. Do you know what type of chain rings and cassette they gave you. I would be interested to know how they geared the loaner bikes. Great ride Ray, and great summary. i’d love to hear more about the MTB descent – that sounds like the best bit of the trip! Cracking article as ever, Ray. Your ability to take pics while on the move will never fail to impress! As an aside, I completely agree about finding the last few KM easier. Heading up I had no idea that I would be down to the last 6k once I hit the restaurant and the end of the treeline. I think it gave me such a boost that the rest just flew by. Its interesting you say the update is free because my emails with support indicated I would have to pay $25 for the update. I hope that’s true because I was really annoyed that Polar would ‘punish’ its early adopters by charging us for something like this. As I live in Florida I’m not sure I’m going to rush to be without my watch any time soon for altimeter use but maybe when I get a tri watch this summer, I’ll send it in for the update. Thanks Ray. I actually believe your information. The CS rep I talked to was within a couple days of the announcement of the firmware update. A few other people had the same thing to say on the Polar facebook page. I’m guessing they changed their mind on it. which unit do you like most? 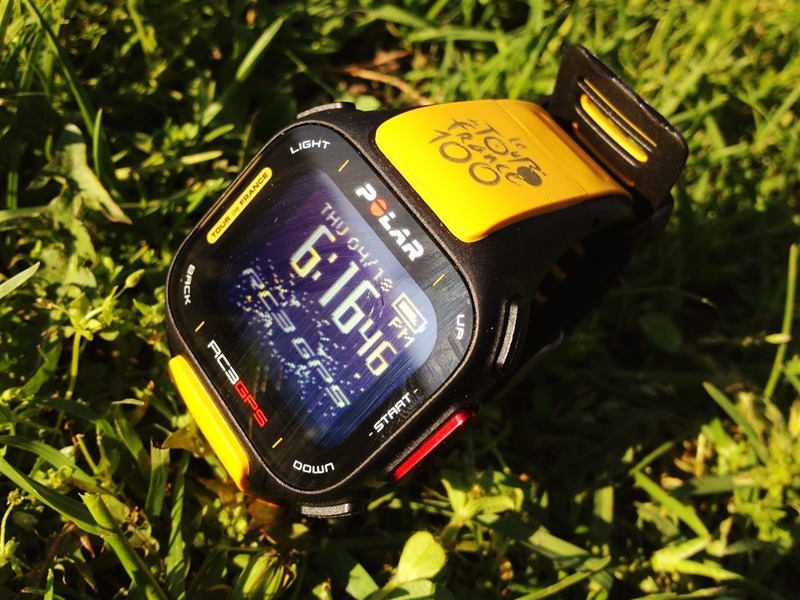 the regular RC3 GPS oder the new coloured RC3 GPS TDF edition? Would you recommend it on a MTB? Obviously, I prefer the firmware updated one over the one without it – simply because of the altitude. how did the Look bike ride? how was the shifting on the front derailleur? I’ve read about issues with that. I had no major issues with it. I did find the front shifting a bit ‘slow’ for my liking. Perhaps I was somehow doing it wrong, but it just seemed to move slow for me. By the same token, this was about the longest I’ve spent on a bike with electronic shifting (3hrs). This does have a sharper display – but I wouldn’t say the older display was bad either. So I consider that a ‘nice perk’, but certainly not something to make a decision on. Awesome article! 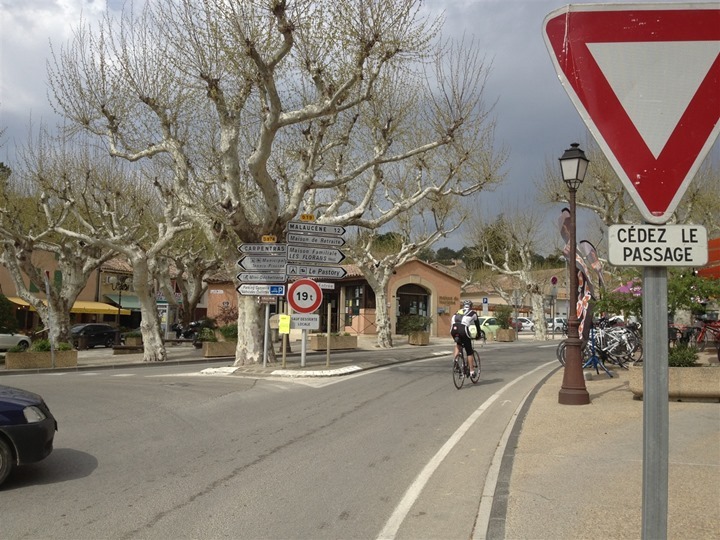 Heading to Bedoin/Ventoux then Paris (& the cupcakery!) in September. Wondering if you remember the hotel where you stayed in Bedoin? The ones I’m finding are all well outside of town. Btw, it’s far more basic than the photos on the site show. Not that that’s a problem (it was fine for me), but I’d say the hotel site definitely makes it look like a swanky 5-star resort, which it’s not. But, it’s near the center of town (a couple hundred yards). And if you’re cycling or spending our time away from it – it’s perfect. Those with the ability , should make enquiries about the ” Register ” , available , in which to record your result in riding the 3 separate climbs of Mont Ventoux . I heard about this , after leaving , having done the Triple in early Feb 2013 . 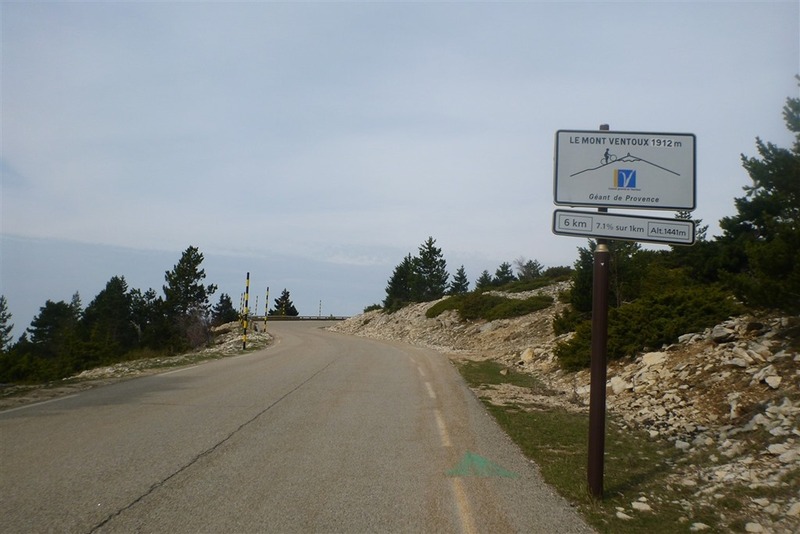 Having done the Sault & Bedoin climbs on the Saturday in glorious sunny weather , i stayed over and starting in Maulecenes , did the triple on Monday , finding a few other Cyclists along the way enjoying the sun . 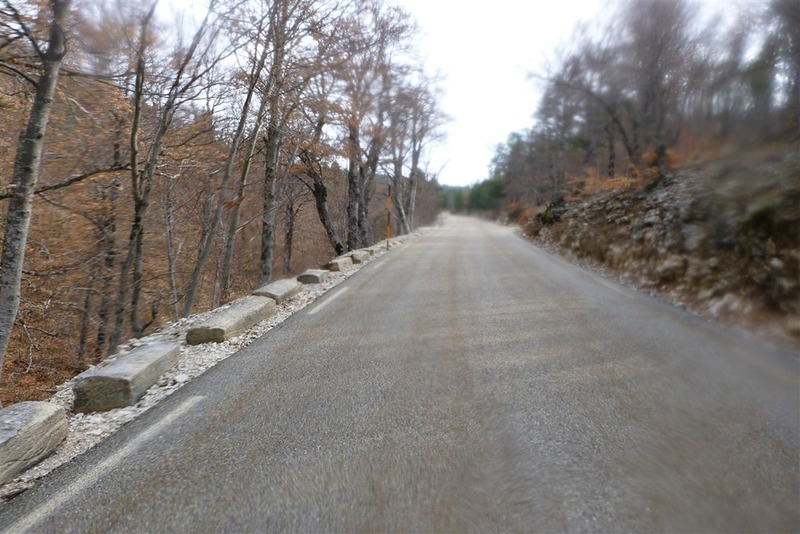 Empty roads helped make the climb somewhat easier , but whilst having 42×27 available , i rarely went to the 23 cog . Mostly relying on a smooth tempo rather than trying to set a record time , who was there , to be impressed ? 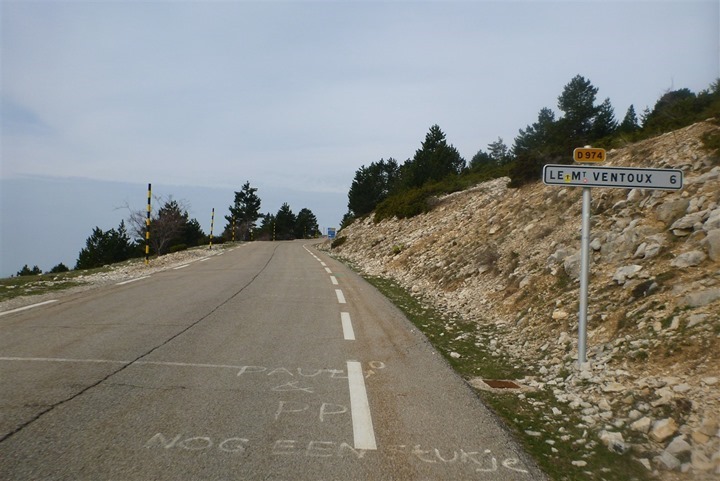 Note my effort was in 2011 ( typo ) but had done climbs during TDF & Dauphine Libere Events in previous years , including the year when Lance let Pantani win ? Very nice story, good pix. It brought back memories. This past June I did Ventoux from Malaucene, riding there (10k) from beautiful Vaison-lLa-Romaine. Good warmup for a climb that is, according to locals, a little tougher but not as visually spectacular. Still stunning with much suffering. Keep writing! 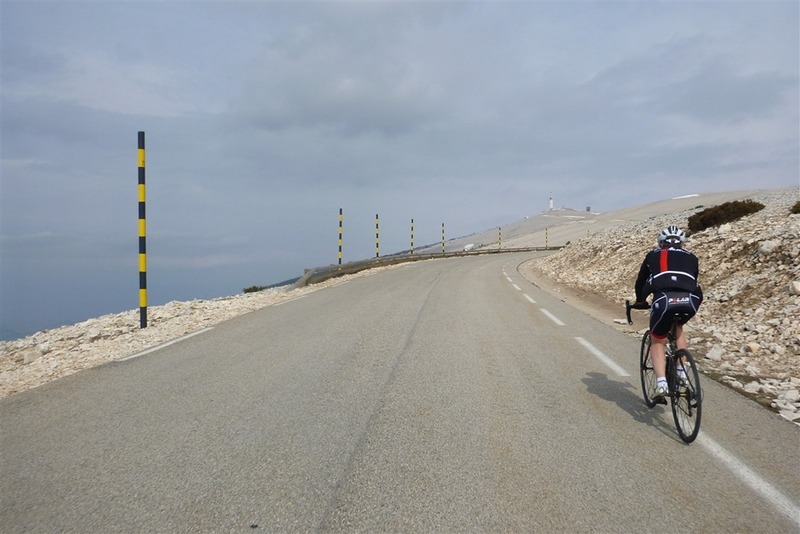 when I was climbing the Ventoux this summer I was on the verge of climbing off my bike from about the 6 km mark to the 10 km mark because I was suffering so bad. Just like you I found that it got a lot easier after Chalet Reynard. One thing I noticed, because I was looking like a crazed man at the cycle computer hoping to be put out of my misery, was that the distance between the 1 km marker and the 577 m marker was about 1 km. I even checked it using the odometer in my car the next day. And finally a question: Did it take you about 1.44 to climb?